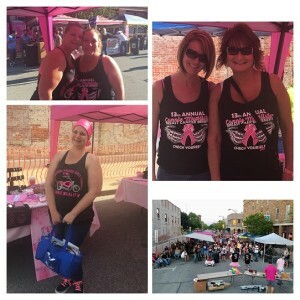 We were proud to be one of the sponsors for the 13th Annual Connie McAlister Poker Run on Saturday June 10th in Auburn, Indiana. The event started with the Poker Run and included a day full of activities and entertainment like auctions, raffles, live music and dinner for all participants. Those who did not run were still able to participate in the activities and support this great cause. This is a non-profit organization that developed in 2005 after a dear friend of the founder lost her battle with breast cancer. Unfortunately, she did not have early detection or the financial resources to aid in her fight. She meant a great deal to the founder and other friends and they decided that they needed to do something; not only in her memory, but also to raise awareness and help individuals in their community that are struggling to pay for medical bills or treatments. The organization feels that anything they can do to alleviate some of the burden during this difficult time is worth all the effort! Even if only for one person, they know that “WE TOGETHER” can make a difference in the lives of others. Over the past 12 years the event continues to grow, as well as their passion to help others.